Many people like to own some gold. It’s a shiny yellow metal and brings up romantic images of Pirates, Spaniards, the Wild West, James Bond Movies, Fort Knox, Bullion, Nuggets and Jewellery. It also has a reputation for being stable and immune to the inflation and devaluation that affect fiat (paper) currencies. Wars and economic uncertainty almost always spark interest in the metal. I personally don’t care much for gold as an investment because it generates no income, but a reader asked for my opinion on what are the most convenient and cost-effective ways to invest in gold. I consider the following methods to be the most convenient due to their accessibility, ease of use and relatively low fees. I must note that I have never personally used them. These are listed stocks that allow investors to buy a share in an allocation of gold that is held by a trustee in a vault. Each share represents a beneficial interest in a unit quantity. For example, each share in the ASX-traded stock ‘GOLD’ entitles the shareholder to a beneficial interest in approximately 1/10th of a troy ounce of gold, and the share price trades at the current Australian dollar value of that amount (AUD$115.70 at the time of writing). For an investor, the only immediate expenses are brokerage and the buy-sell spread. There are internal administration expenses such as gold storage fees and these are reflected in the share price. These are a form of electronic money that is based on unit amounts of gold. These are issued by private companies that operate websites, the most famous being E-Gold. Think of it like Paypal, except your account balance is measured in ounces or grams of gold. You can top-up your account by purchasing gold at the current market price in a supported currency, and you can redeem gold at the current market price. You can send and receive any gold, to and from other parties. Each time you carry out a transaction, you are typically charged a commission, based on a fixed quantity or a sliding percentage scale. Online digital gold currencies have generated controversy due to their abuse by fraudsters and money-launderers. 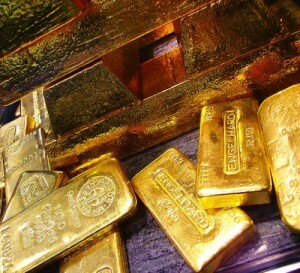 Questions have also been raised about the proportion of clients’ funds that are actually held in gold bullion, but I am not aware of any cases in which the digital gold providers did not meet their financial obligations to clients.